When it comes to buying speakers, we all have different reasons for deciding what type of speaker we want. Well, the Propel Bluetooth waterproof self balancing speaker is for someone who wants their speakers to take a swim in the same water as them. In this day and age, buying new gadgets is sometimes about being able to show off, and this little ball of orange sure does manage to do that. Most other speakers boast durability and ruggedness; in fact, it’s hard to find a product description for Bluetooth speakers these days which doesn’t mention something about how it can stand up to varying degrees of water being thrown on it. 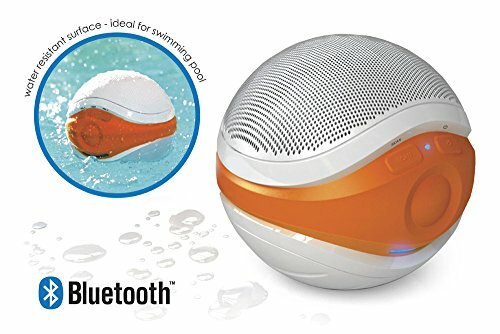 The Propel Bluetooth waterproof self balancing speaker manages to not only stand up to varying degrees of water, it can float in it as well. This speaker really falls into the gadget market, and is less of a mainstream portable Bluetooth speaker than a niche toy. This means that what you are going to be looking for is different. The Propel Bluetooth self balancing speaker is more about making sure that your device can do something other peoples can’t, and that certainly does apply to this device. Because this extra ability is to self-balance in water, it’s going to have to be judged based on two categories: How water resistant is it and can it actually self-balance? The more standard specifications you probably usually look for, such as speaker size, do need to be looked at, but are probably less the main features and more similar to footnotes. Regarding those footnotes, Propel have packed this device with only a 5 watt speaker. This is fairly average, but still manages to pack somewhat of a punch. It’s not going to be headlining any raves, but it’s also not going to mean you can’t hear it. In addition to the speaker size, you will probably wonder about the battery life. Well, there are positives and negatives. The battery life might be 6 hours, but it makes use of batteries. Nowadays, the use of batteries in portable devices such as Bluetooth speakers, is generally limited to the use of rechargeable, non-removable products. Whilst for some, being able to use disposable batteries might be great, I am going to put this down as a con. Now for the part you’ve actually been waiting for. Does it float? I have to say that it actually does. Many reviewers have had great experiences with this device and have used it whilst it was floating. However, this doesn’t seem to be quite the same across the board. Some users note problems with sound quality, with one even referring to it as a “silent floater". It will, however, appear to still float the right way up; so its self-balancing features do continue to work. It floats – This is probably the most obvious pro when it comes to what Propel have put together here: it does actually float. If this is a feature you’re actually looking for, then you’ve found it. IPX7 – The Device comes with IPX7. It’s water resistant, and will last when it comes into contact with most types of liquid. Speaker – The 5 watt speaker isn’t so bad that it makes this device useless, it’s just a bit of a con if you are going to compare it with the other options on the market. However, if you wanted a louder speaker, you probably would not be looking for a speaker which is capable of floating. Build quality – Unfortunately, some reviewers find this to be nothing more than silent floater. It is possible that this is just them being unlucky, or that build quality differs quite a lot between each unit. Batteries – Yes, this needs batteries; 6 AA batteries to be precise. In this day and age of built-in batteries capable of being recharged again and again, this is a strange choice. Moreover, most reviews complain about both the placement of the batteries (it’s not very obvious) and that you actually do have to replace them. Personally, this would be a serious drawback for me. IPX7 – This does mean that Propel’s device can stand up to most attacks from water. However, IPX7 devices should not be submerged. Considering that this is actually designed to operate on bodies of liquid, it should probably be IPX8 rated – meaning that if you accidentally were to submerge it, it would definitely be ok. Overall, the Propel Bluetooth speaker does what it says on the packet – albeit better for some than others. It’s not the nicest speaker when it comes down to what is happening specification wise, but it never claimed to be. If you’re looking for a speaker capable of floating in water, this is one of the options. However, others might offer you more peace of mind when it comes to reliability. If you want other options, check out our other picks in the pool speaker category.